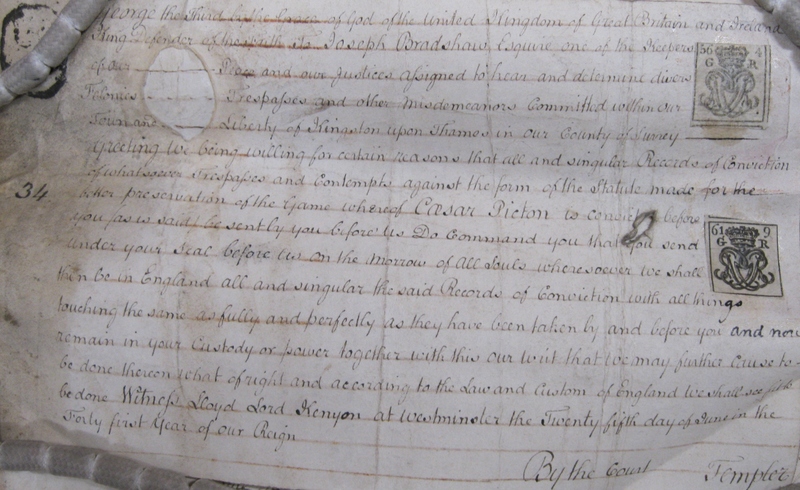 In November 2014 Kingston ran an event on ‘Africans in Georgian London: Cesar Picton and his World in Film and Records’, which explored the life of Kingston’s most famous eighteenth-century black businessman based on new documents discovered at The National Archives. One of those attending that night was Kathleen Chater and here she tells how she found fascinating new evidence about Picton. Buried in the records of the Court of King’s Bench is a case involving Cesar Picton that may shed light on his relationship with at least one of his neighbours. I found it through a keyword search of the on-line British Newspaper Archive. On 4th February 1802 the Morning Post published a brief item in its Law Intelligence column summarising a quibble over the actual date when a conviction against Caesar [sic] Picton had been signed. The full judgement in the case is published in Reports of cases argued and determined in the Court of King’s Bench (1802) where the details of the case are revealed. On 26 September 1801 Picton had appeared before a Justice of the Peace in Kingston-upon-Thames, accused of contravening the game laws on 16th of the month by shooting game when he did not have the legal right to do so. He had offered no evidence so was convicted and fined £5. However, the JP had made an error in signing the conviction, giving the date as 40 Geo. 3 instead of 41 Geo 3. The Court of King’s Bench decided this was not grounds for overturning the conviction, defining it as “surplusage”, extraneous matter which does not affect validity. The published account gives only the initials of the magistrate, the man who laid the information and his witness. Time for a trip to the National Archives. The online catalogue to the records of the Court of Kings Bench are minimal and on a previous visit I’d searched through several boxes of cases in vain before having to leave. This time I went in the company of a Canadian descendant of Picton’s main heir, who had contacted Nicola Phillips at Kingston University after reading the blog post about the event. The three of us were shown the documents of the Chancery case involving him by Amanda Bevan, plus six more boxes of King’s Bench papers. Rhiannon Markless, who specialises in eighteenth-century crime and criminal records, helped me search these boxes and finally found the relevant documents in KB11 61, Part 1. They contained essentially the same information as the published report but also the names of the JP, Joseph Bradshaw; the accuser, William Davis, maltster of Kingston-upon-Thames, and Davis’s witness, James Carter, yeoman, also of Kingston-upon-Thames. Carter had known Picton “for several years” and confirmed he had seen Picton “keep and use a gun to destroy the game” on 16th September 1801. It’s worth noting in passing that Picton’s race is not mentioned in the newspaper report or the court records. Cesar Picton’s Record of Conviction (KB11 61, Part 1) reproduced here by kind permission of The National Archives. This was a very trivial case but it raises interesting questions. The Game Laws of the period, designed to punish poaching, were severe and, although they had by 1801 been slightly relaxed, the right to shoot game was very limited. Technically Picton had been poaching with an unlicensed gun, and had he remained lower down the social scale, he might have faced execution or transportation to Australia. A fine of £5 was nothing to him. So why didn’t he just pay up and have done with it? Picton needed to hire a lawyer to look for and find grounds to appeal. His attorney, Mr Manley, was possibly the John Manley of Bloomsbury Square who in 1801-2 chaired the Committee of the Society of Gentleman Practisers in the Courts of Law and Equity (now the Law Society), and his services would not have been cheap. Taking a case to the Court of King’s Bench was also expensive. The key to this, I suspect, are Picton’s relationships with the accuser, William Davis, and his witness, James Carter, who claimed to have known Picton for several years. There is a definite whiff of personal animosity here, but whether it was between Davis and Picton, both businessmen in the town; or between Picton and Carter, maybe over a boundary dispute; or even that Picton just didn’t get on with the other two, remains as yet unanswered. At this time, Picton was still living in the High Street in Kingston: he did not move to Tolworth until 1807 so the location of James Carter’s property will be crucial. Did Picton simply stray by accident on to a neighbour’s land or had he deliberately travelled out? He was about 46 at this time. Although in later life he became grossly overweight, he seems to have been fit and mobile enough to go shooting. It may be possible to find more information in the Surrey Record Office in Woking and I intend to look on my next trip there. It is unlikely Joseph Bradshaw’s notes of the case have survived – very few records of these Petty Sessions have – and unfortunately the case did not progress to Quarter Sessions or Assizes. However there may be more about Davis and Carter which could shed further light on this tantalising case. Watch this space. Kathleen Chater is an independent scholar and author of Untold Histories: Black people in England and Wales during the period of the British slave trade, c. 1660-1807 (Manchester, 2009). You can hear her discussing her book in a TNA podcast here. Image | This entry was posted in Archives, Black History, Local History and tagged Black History, Cesar Picton, Crime, The National Archives. Bookmark the permalink.